Plasti Dip is an air-dry, specialty rubber coating. In fact, it’s the original peelable, flexible, insulating, non-slip, durable rubber coating. The Plasti Dip product line provides a wide range of coating solutions from automotive customization to home improvement. With over 50 colors and enhancers of Plasti Dip, including a Create Your Color Kit, the possibilities are endless! Plasti Dip multi-purpose coating is ideal for a broad array of do-it-yourself projects around the home, garage, garden, and elsewhere. With so many colors, your craft and DIY possibilities are endless! All colors are available in 11 oz. aerosol cans. Red, Yellow, Black, White, Gunmetal Gray and Blue available in 14.5 oz. containers. Clear and Black also available in 22 oz. containers. Create a glow-in-the-dark look by adding our Glow colors on top of Plasti Dip White spray. Plasti Dip Glow is available in 11 oz. aerosol cans. Unique among Plasti Dip varieties, Plasti Dip Smoke’s color changes gradually as more coats are added. After one or two coats, it’s a light, smoky gray. Each additional coat gives Plasti Dip Smoke a darker, deeper hue—from gray to charcoal to black, all with the same distinct smokiness. Plasti Dip Smoke is available in 11 oz. aerosol cans. Plasti Dip Camo is a special collection of Plasti Dip colors designed to match the many shades of nature. 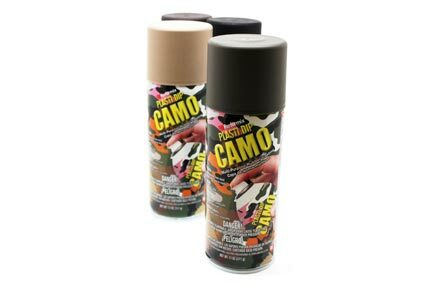 Plasti Dip Camo will help keep your hunting and fishing gear, camping equipment, and other outdoor gear inconspicuous when you’re in the wild—or your own backyard. Plasti Dip Camo is available in 11 oz. aerosol cans. Plasti Dip Blaze is a unique collection of neon Plasti Dip colors that deliver eye-catching looks for any application. Use Plasti Dip Blaze anywhere you need bright, easy to see colors—you can use it to improve visibility for safety concerns, to add can’t-miss color to frequently misplaced items, or for a one-of-a-kind look on almost any do-it-yourself project. For best results and long-term bright colors of the Blaze product line, it is recommended that you pair the product with a white Plasti Dip base coat and then a top coat with Plasti Dip Satinizer™ or Glossifier™, which both contain Fadebuster™ protection. Important information about Blaze colors: Due to their unique composition, fluorescent pigments like the ones used in Plasti Dip Blaze tend to fade faster than other colors. Plasti Dip International has taken preventative measures, including the addition of a UV protector to the formula, to help our Blaze colors stay brighter longer, but some fading is inevitable. However, in most instances, quick touch ups as needed should be sufficient to keep Blaze colors bright. All Plasti Dip Blaze colors are available in 11 oz. aerosol cans. Plasti Dip Blaze Orange and Blaze Blue are also available in 14.5 oz containers. Plasti Dip Classic Muscle is a collection of 13 classic muscle car colors, all a throwback to when muscle cars ruled the streets. Now you can rule the streets too with these bold and bright colors. 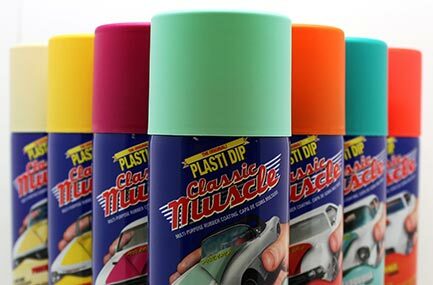 Plasti Dip Classic Muscle is available in 11 oz. aerosol cans. Plasti Dip Luxury Metal is a collection of nine luxurious, metallic colors styled after luxury vehicles. Each luscious color is infused with metallic specks, creating a cool, classy sparkle on anything you dip. Take your car from drab to fab and soak up the life of luxury. Plasti Dip Luxury Metal is available in 11 oz. aerosol cans. Stir gently and thoroughly before each use. Attach wire or string to hang item. Insert item 1” every 5 seconds; withdraw at same rate. 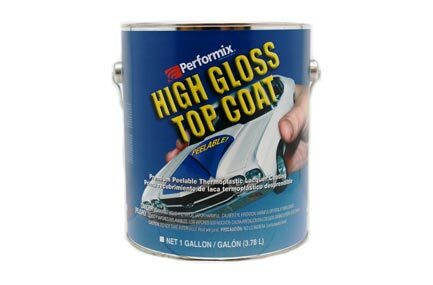 Recommended 2-3 coats for best results. Allow 30 minutes minimum dry time before use. Dilute as needed (10-20%) with naphta. Apply heavy coats; avoid brushing back and forth. Allow 30 minutes minimum between coats. Apply as many coats as desired. If thinning is desired, product thickens, or for cleanup, use naptha, xylene (xylol), or toluene (toluol) solvents. Allow 4 hours per coat for complete dry. Keep container tightly closed when not in use. When applied properly Plasti Dip can be removed from most surfaces, if desired. Always protect surrounding areas from overspray. Allow 4 hours per coat for complete dry. If runs or sags are experienced, move can further away from surface. To avoid clogged nozzle, turn can upside down and spray for 5 seconds. If clogged, remove nozzle and soak in naphtha or mineral spirits for 30 minutes. Do not stick pin or other objects into stem. Use naphtha, xylene (xylol), or toluene (toluol) for cleanup. To greatly increase non-skid properties, sprinkle a generous amount of grit onto wet surface of first coat. Apply at least two additional coats of Plasti Dip. For best results, use a pumice (crystalline silica) grit. Results may vary with other grit additives. When applied properly Plasti Dip can be removed from most surfaces, if desired. 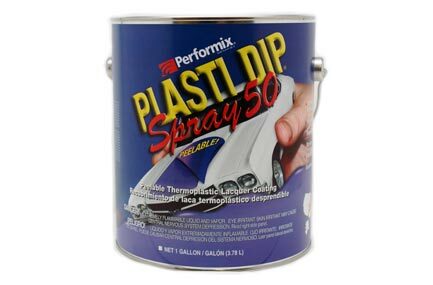 Plasti Dip Spray and Plasti Dip Spray 50 come in a gallon-sized container to be used for automotive purposes only. With so many colors, it’s easy to customize your car, peel it off, and dip it again! *Professional use includes auto body paint shop, dealer, fleet repair, and applicator of products for compensation. Use adequate ventilation. Mix well before use. Apply using electric turbine style spray system or an HVLP spray gun with pressure pot system. All surfaces to be coated must be free of oils, grease, dirt, wax, and loose rust. For best results the surfaces being coated must have a smooth unbroken OEM finish. Apply using only compliant / approved HVLP gun (electric turbine style) that meets all local regulations. Keep spray gun 10-12 inches away from surface, applying wet overlapping coats. Allow 10 -30 minutes dry time (dry to the touch) before applying additional coats. A minimum of 5 coats is recommended for best performance and easy removal. Mix Plasti Dip Spray thoroughly before each use and refilling of spray equipment. A dry coating thickness of 10 mils minimum is recommended for best performance and easy removal. Allow 4 hours cure time for each coat applied before using. Avoid excessive air movement, heat and humidity while applying. Always use proper ventilation. Plasti Dip Spray Colors – suitable for application over most cast or calendered vinyl, cast vinyl with Poly Urethane clear laminated or Poly Urethane clear top coat finish, as well as most Poly Urethane protective films. Applying High Gloss Top Coat over Plasti Dip Spray colors can cause some dulling when combination is applied over cast vinyl. 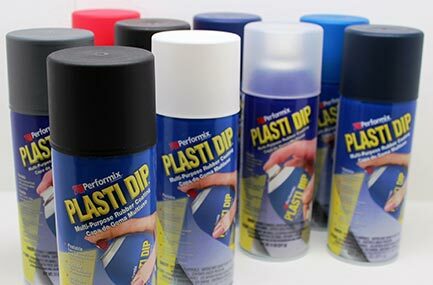 Plasti Dip Spray Clear – suitable for applications over cast vinyl, cast vinyl with Poly Urethane clear laminated or Poly Urethane clear top coat finish as well as most Poly Urethane protective films. 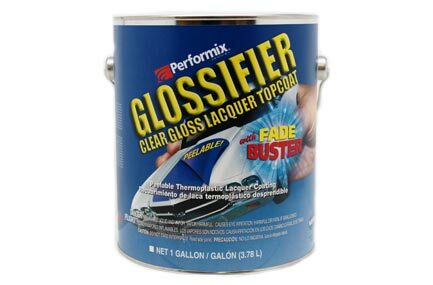 Plasti Dip Spray Clear may cause some dulling of finish when removed from calendered vinyl (there is less UV protection with Plasti Dip Spray Clear than with the Plasti Dip Spray colors). For consumers who cannot purchase Plasti Dip Spray, Plasti Dip International has provided Plasti Dip Spray 50. Apply using only compliant/ approved HVLP gun (electric turbine style) that meets all local regulations. Keep spray gun 10-12 inches away from surface, applying wet overlapping coats. Allow 10 -30 minutes dry time (dry to the touch) before applying additional coats. A minimum of 5 coats is recommended for best performance and easy removal. 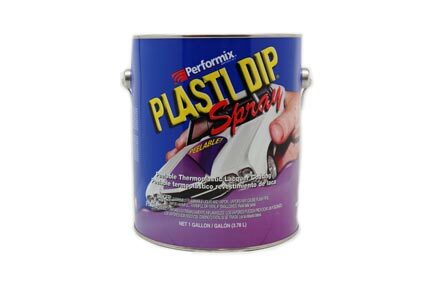 Plasti Dip Spray 50 Colors and Clear – suitable for application over most calendered vinyl, cast vinyl with Poly Urethane clear laminated or Poly Urethane clear top coat finish as well as most Poly Urethane protective films. 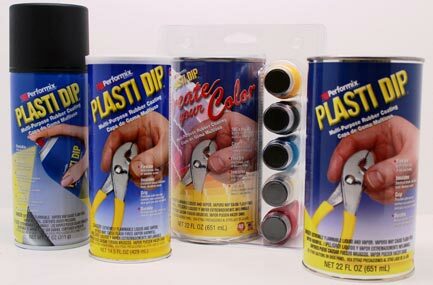 Plasti Dip Spray 50 Colors and Clear – not recommended for applications over cast vinyl! Plasti Dip Glossifier adds Fadebuster™ protection and a glossy, polished shine over any Plasti Dip color. All surfaces to be coated must be free of oils, grease, dirt, wax, and loose rust. Must be used in a well-ventilated area. Apply using HVLP spray system. Keep spray gun 6-8 inches away from surface, applying wet over lapping coats. Allow 10 – 20 minutes dry time before applying additional coats if needed. Refill spray system frequently. Avoid running empty which can draw air into spray system. Mix thoroughly before each use and refill. Apply additional coats as needed. Allow 4 hours cure time. Avoid excessive air movement, heat and humidity while applying. Always use proper ventilation and protection. Plasti Dip High Gloss Top Coat adds Fadebuster™ protection and a lustrous finish over any Plasti Dip color. Apply using HVLP spray system. Keep spray gun 6-8 inches away from surface, applying wet over lapping coats. Allow 30 minutes dry time before applying additional coats if needed. Refill spray system frequently. Avoid running empty which can draw air into spray system. Allow 4 hours cure time, depending on temperatures and humidity. Avoid excessive air movement, heat and humidity while applying. Always use proper ventilation and protection. Avoid any changes in temperature or humidity while coats are drying to avoid blushing. Also, allow each coat to fully dry before applying more product. Plasti Dip Primer is specially formulated to complement Plasti Dip’s already outstanding performance by giving it a better, stronger grip on metal and many plastic surfaces. 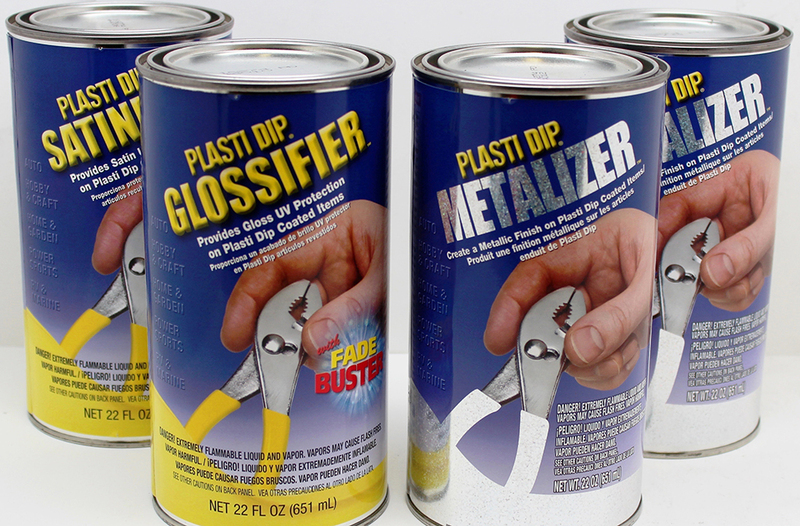 To improve adhesion, apply Plasti Dip Primer on metal surfaces before applying Plasti Dip. Always protect surrounding areas from overspray. Allow 4 hours per coat for complete dry. If runs or sags are experienced, move can further away from surface. To avoid clogged nozzle, turn can upside down and spray for 5 seconds. If clogged, remove nozzle and soak in naphtha or mineral spirits for 30 minutes. Do not stick pin or other objects into stem. Use naphtha, xylene (xylol) or toluene (toluol) for cleanup. Seller cannot control use of this product and will not accept liability for more than product replacement. 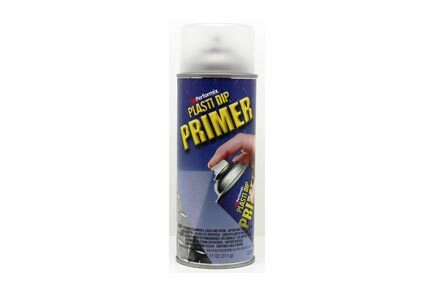 Plasti Dip Primer is available in 11 oz. aerosol cans. While Plasti Dip with a Primer undercoat can be removed with a great deal of effort, the Primer itself cannot be removed from the original surface once it has dried. Use care when applying Plasti Dip Primer. Not intended for use with any other product. Plasti Dip Enhancers are specially designed to make our already outstanding Plasti Dip Colors even better. Our Enhancers are easy to use and will give any Plasti Dipped item a unique look. 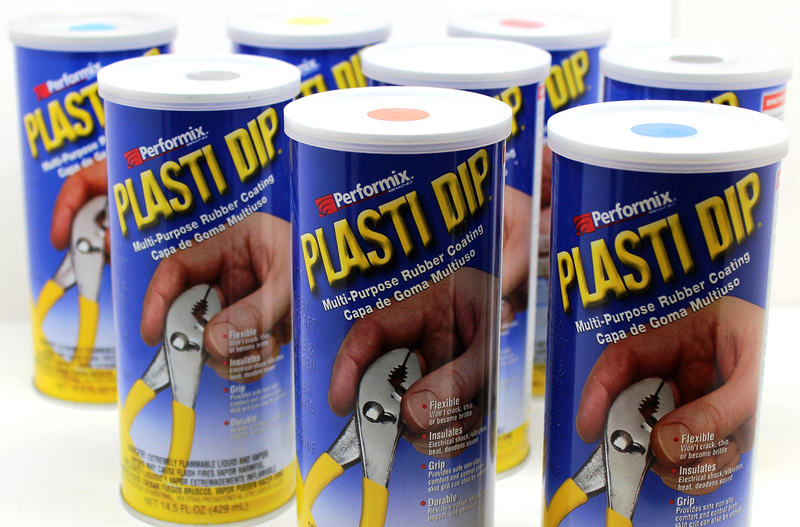 Plasti Dip, whether in our original dip-on/brush-on formula or our aerosol variety, dries to a soft, satin finish. 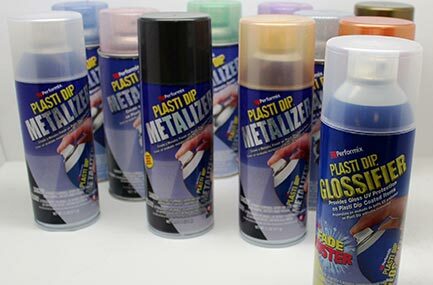 Plasti Dip Metalizer Enhancer is a shimmering, metallic finish while letting the color of the Plasti Dip underneath show through. 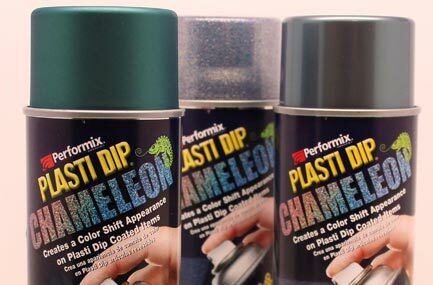 Plasti Dip Chameleon adds a color-shifting iridescent shimmer over Plasti Dip Black. 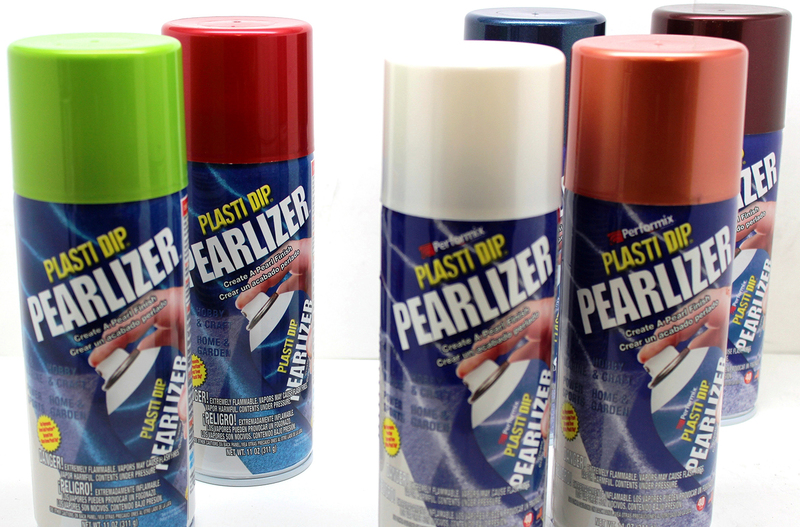 Plasti Dip Pearlizer Enhancer will add a one-of-a-kind luster to any dried, cured Plasti Dip coating. It gives a pearlescent sheen and gleamy luster to any Plasti Dip color. Plasti Dip Satinizer adds Fadebuster™ protection to your Plasti Dip color while maintaining the satin luster of Plasti Dip color. Satinizer and Glossifier™ are especially recommended for use with the Plasti Dip Blaze product line to keep the color’s vibrancy. Plasti Dip Glossifier adds a glossy shine and provides Fadebuster™ protection to any Plasti Dip color. With Plasti Dip Glossifier, you can give any Plasti Dipped item a glossy, polished look. 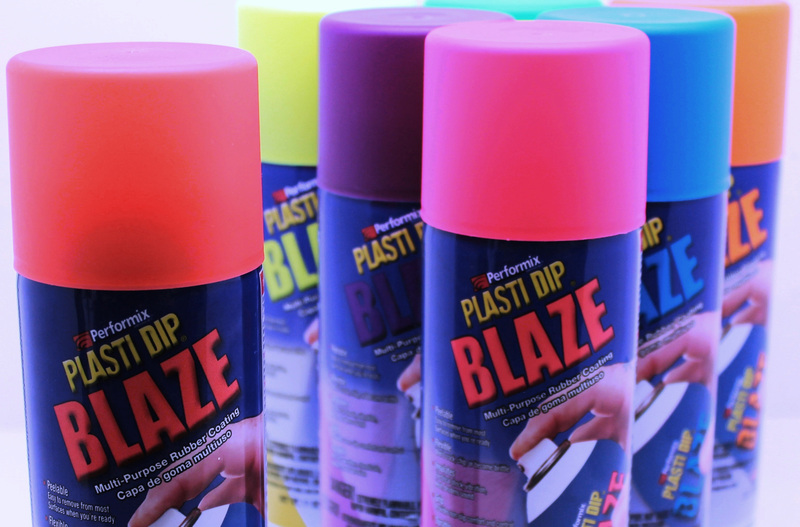 Satinizer and Glossifier are especially recommended for use with Plasti Dip Blaze products to keep the color’s vibrancy. See individual labels for recommended number coats. Silver and Gold Metalizer available in 22 oz containers. The Create Your Color Kit comes with one 22 oz. can of Clear Plasti Dip and five specially formulated tints, providing everything you need to create custom colors. For best coverage, use a combined total of at least one bottle (no more than 2 bottles) of tint.